Be a 21st Century Transformational Leader. One of the greatest problems we all face is how to overcome and dissolve fear. When you can overcome your fear of any problem, you have gained control of it; it no longer controls you. You are well on your way to solving whatever it is that is going sideways in your ability to communicate powerfully. In speaking to over twenty thousand people in a two year period, I discovered that at the heart of every single person in my audiences was a deep desire for peace, love, harmony and good will. The problem is when we are faced with people and conditions that are hurtful and to be effective we must learn and apply ways that are NOT equally harmful in order to resolve issues. Many people feel they are justified in responding back in an equally hurtful manner ... and yet, does it ever really feel good? Generally, most individuals are left wishing they could have done better to generate positive outcomes. I was one of those people and even now, I seek to find the most healing communication to bridge our individual differences without joining others in less constructive ways to communicate. In today's world, budgets are tighter than ever. Business owners, Managers, Administrators, Principals as well as Administrative Professionals, are now tasked with a great amount of staff training... so we've made it easier for you! I am also “on the road again” traveling around the country doing Keynotes plus one and two day trainings. If you or your company is interested in taking your group to the next level, here is my #1 most requested topic and information about how you can schedule something today. Fire up your staff - and improve your results - with the famous morale-building COMPASSION philosophies that create team SYNERGY and rocked the management world. What's more, you'll learn straight from the best-selling co-author, Mary Robinson Reynolds! Mary Reynolds turned the management world upside down with her co-author, Elizabeth Silance Ballard's, Teddy Stallard Story in their newest companion gift book & DVD: The Power of COMPASSION: 7 Ways You Can Make A Difference. A Remarkable Way to Boost Morale and Improve Results. Featuring key lessons learned from the Teddy Stallard Story and the COMPASSION philosophy has been wildly embraced by business leaders worldwide to improve morale, reduce turnover, offer better customer service and increase bottom-line results. You will Learn How to Best Utilize the New Science - Quantum Mechanics & Field Theory - in Building SYNERGISTIC TEAMS. 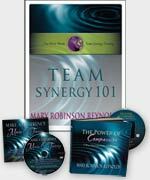 Now your team can learn how to implement the basic SYNERGY principles that have brought such great success to other organizations, thanks to this high-energy Team SYNERGY 101 3-6 hour training experience (either on-site or on-line) led by co-author Mary Robinson Reynolds herself! With humor and insight, she'll inspire and motivate your people to bring more passion and enthusiasm to the job, choose a positive attitude, make work more fun and take pride in providing exceptional customer service. Mary will outline the no-cost steps to creating a playful, highly productive work environment where employees love their jobs. Transformations in organizations that have incorporated the SYNERGY principles have been nothing short of phenomenal, with reports of re-energized workplaces where morale soars and customer service is at record-high levels of excellence. Internal Revenue Service IRS • Intel • Regence BlueCross BlueShield • Sprint United Telephone • Boeing • Arthur Andersen & Company • Walt Disney World • International Association of Administrative Professionals • Elkay Manufacturing • Mutual of Omaha • BLM - Bureau of Land Management • Albany General Hospital • Health Underwriter's Association • The Salon Association-TSA • Progressions Salon • Pfizer • Goldwell Beauty Supply • Nikken • Microsoft Corporation • Oasis • Mannatech • Isagenix • Boise Cascade • Hilton Hotels • Procter & Gamble • Techtronix • Dave Hamilton Car Dealership • University and Community College Systems of Nevada • Portland State University • and More!